Day 75 in Beijing: Shopping Logic. The local Wu-Mart has about 50 to 75 people working the floor, selling stuff, folding stuff, talking to each other, talking to customers, allowing you to test things, and, in general, doing everything humanly possible to keep themselves, and you, the customer busy. It truly is a consumer’s dream. The lines stretch well into the distance. The check out line, on the other hand, is always understaffed. 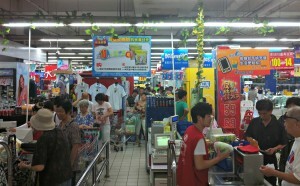 When I arrived, the two cashiers had about 6 people waiting at each check out stand. By the time I checked out, it was up to about 20 people in each line. No one had called for another check out clerk and numerous employees had walked up, looked at the line, and then smiled and walked away. There were four more check out stands waiting to be used. I’m guessing that people are trained to do specific jobs and that they stick with them. They are probably not allowed, or taught, how to do the check out and they only have a limited amount of people working the check out areas. This leads to a lot of long lines and it can be fairly frustrating to most the people in line as they seem to be asking the employees to bring more people to work the cashier area but the employees don’t seem to have any idea what to do about the problem. This is not a one off event or I wouldn’t bother posting about it. It seems to be fairly common and yet there is little, if anything, being done about it. It does, on a positive light, make one really decide if what they are buying is worth the time, money and effort. And, maybe, just maybe, people won’t buy as much and be less consumer oriented.